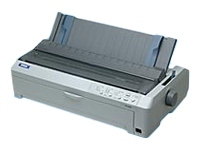 High speed dot matrix printer for medium and large print volumes. As well as printing A3 sheets at an incredible 680 cps the Epson FX-2190 is exceptionally economical to run, offering the high productivity printing solution demanded by business: from warehouses and wholesalers through finance departments and labs. Compact robust design with versatile paper management, the Epson FX-2190 has the ability to handle up to 6 part forms and its flexible paper management allows for paper insertion from the front, top, rear and bottom. Extremely robust, this wide carriage 9 pin dot matrix printer is ultra reliable across all stationery types. The optional additional tractor unit enables the printer to either accommodate two continuous forms at the same time, or to use push and pull paper feeding - ideal for commercial and industrial environments.